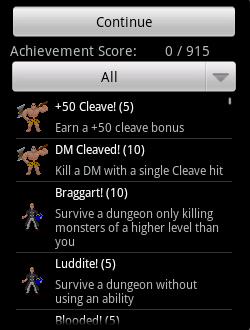 Achievements in Dungeon Ascendance are all worth points. Harder achievements are worth more points. Makes sense, eh? Get to the Achievements screen from the Main Menu or by using the Menu button when in-game. Do you really know the DA classes? Two unique achievements for each class. Other interesting things to do - starving, killing, inflicting massive damage etc. !